Get ready for a great fishing expedition aboard our 36' Custom boat, our captain and crew on this boat are highly experienced, they are expert fishemen, have participated in multiple tournaments. 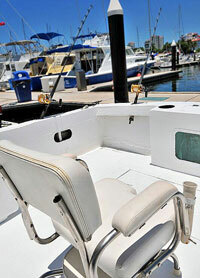 If your target is to catch some great sailfish, wahoo or marlin then this is the boat you need. This boat is fully equipped with the best fishing gear, reels and everything you need to have a great day in the sea. We offer some of the most famous fishing grounds in all of Puerto Vallarta, including El Morro & Marietas (8 hour trips), Corbetena (10 hour trips) and El Banco (12 hour trips) where the fish of lore are found. See More.